From Edinburgh/City Bypass head south on the A1 towards Berwick upon Tweed. 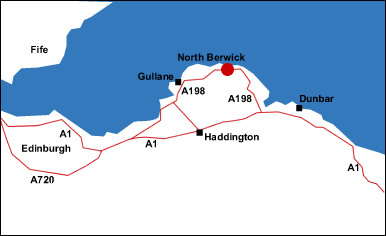 Exit A1 at the Bankton Junction and take 2nd exit onto the A198 (signposted North Berwick). Drive through Longniddry and follow signs for Drem/North Berwick. Pass through Drem then Dirleton on your left and a couple of minutes after you will enter North Berwick along Dirleton Road. From the South come off the A1 after Dunbar at the Thistley Cross Roundabout onto the A199 (signposted East Linton). A few miles along the road turn right onto the A198 (sign posted North Berwick). Go through Tyninghame, Whitekirk and Auldhame). Enter North Berwick on Tantallion Road. Follow road round onto Easter Road and then down to the High Street. 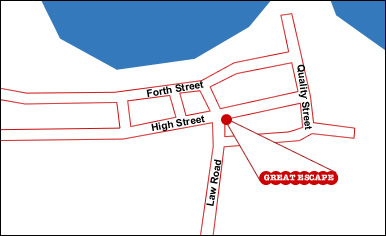 The shop is located at number 57 High Street. The High Street itself is one way and there is some limited parking spaces which you can park in for 90 mins. You can also sometimes park virtually outside the shop - if you avoid the traffic warden! However right behind the shop there are two car parks - both of which are free.